During our recent SR! tours of Oregon, a number of riders had issues reading their GPS files. If you've been navigating routes with a Garmin GPS for a number of years, perhaps we won't be telling you anything new here, but if you're new to GPS, you may find this helpful. Frustration #1 - When I load a route into the GPS, all I see are the waypoints and not the route lines. Solution A - Garmin has done a remarkable job of lowering the prices on their GPSs in order to compete in the auto market. Today you can get a eTrex for just $300. But it won't allow you to upload and read routes. Not just yet. Most of Garmin's lines (60 series, eTrex etc...) other than the Zumo line will not route until you spend more money and purchase a version of their high-end MapSource Software such as City Navigator or Topo, which will run you $139. You thought you were getting a deal and in fact you still are. Attention Nuvi owners. When it comes to uploading routes, your device is not going to function as you need it to. While it will allow you to export your trip log, you cannot upload routes, tracks or trip logs and view them. You would need to upgrade to a device that allows such functions, like a Zumo, Colorado, Montana, Oregon and so on. If you are planning to use a GPS during one of our events (Road Trip, Sasquatch, Rally in the Gorge) - a Nuvi can't provide the routing capabilities you need. The route lines should follow the road in both your MapSource software as well as in your GPS. Once you get the software, you must download it onto your computer, register and unlock it, then upload the detailed map sets you need into your GPS. Now you can read a route someone else has created. And don't be fooled when Garmin tells you that the GPS comes with all the maps loaded already. That may be so, but until you pay the additional rate, you will not be able unlock your units ability to read custom routes. Frustration #1B - I can't seem to load the route file from the software into the GPS? Newer model Garmins may not allow you to do this via City Navigator or BaseCamp. The work around is simple. Attach the GPS to your computer. When the window showing the GPS files opens, locate where other GPX Files are stored. Using your City Navigator or BaseCamp software, "Save As" the route file you have to the GPX format and then copy that file into the folder with the other GPX files. Now your GPS will advise you you have new routes that need to be imported, Answer yes. Frustration #2 - The GPS told me to turn down a walking trail and I don't want to go that way. When individuals create custom routes, they do it with one of two routing preference options provided in the MapSource Software, 'Fastest' or 'Shortest'. If I create the route using the 'Fastest' and your GPS has a routing preference set at 'Shortest,' then it's anyone's guess where you're going to wind up next. This usually makes for some good storytelling later in the day. But if you want to be sure you're going where you're supposed to go, be sure to check with the route provider as to which preference was used in creating the custom route. Frustration #3 - I got to the National Park entrance and the GPS told me to make a U-turn rather than continue into the park. Garmin's latest firmware provides for 'Seasonal Closures' and knows many roads that are closed in the winter. Look through your routing options and remove the checkmark for seasonal closures under 'Avoidances' in your navigation options. In fact, if you're going to be using someone else's route, uncheck all the avoidances. Frustration #4 - I pulled out for gas and my GPS re-routed me. Thus I missed all the cool stuff. Most Garmin units ship with 'Recalculation Mode' set to 'Auto' which will screw up a perfectly good route just about every time you get off it. In motorcycle touring, getting off the route is common, so don't let your GPS throw you for a loop (sometimes literally). Instead, change the setting from 'Auto' to 'Off' (my preference) or 'Prompted' which will advise you you are off the route. Frustration #5 - Someone has played a rotten trick on me and set the verbal commands in my Zumo from English to Cantonese. Now I'm totally lost. and choose the language character that is more to your liking. And remember - you're on a motorcycle ride. Listening to your GPS, music and other distracting noises (like that 102 db loud pipe in front of you) takes away from the concentration you need to ride your bike the best you can. Consider disabling the voice commands all together. Frustration #6 - My GPS memory is full - Now what? Time to clean it out. It's a good idea to start each ride with a clean GPS memory. Using City Navigator, open a blank file. Connect your GPS to your computer with a USB Cable. Download all your tracks, routes and waypoints from your unit. Then save the file with a name like "JUL11 Dump." Now load just the routes, tracks and waypoints you need for the next journey. Frustration #7 - My maps are out of date. With your GPS plugged into your computer, go to the Garmin website and download the tool that will sniff both your software and GPS to see what version maps you have. If they are out of date, update them. If they ask you to pay to do that, buy the Lifetime subscription which only costs a few dollars more. You can roll it over to another unit later if you upgrade. While you're at it, have the site check your firmware and upgrade that as well if needed. That's free. Frustration #8 - I created a route, but it didn't route as planned when I hit the road. Depending on what software and unit you use this can happen, and when it does it's not nice. To insure you know what the original route you planned in the computer is, use a third party software like WinGDB to rip your routes to tracks (with a max of no more than 500 track points). Then be sure to upload those into your GPS at the same time you upload the routes. Color code your new tracks differently from the routes. 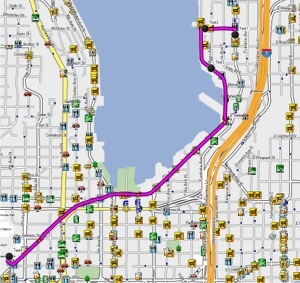 If the routes are magenta, use green for the tracks. When there's a difference in the routing, you'll know just by looking and can follow the track rather than the changed route. Beginning in August 2011, all the GPS file discs we create now have both routes and tracks included. Routes are in magenta, tracks are in green. Frustration #9 - I own a GPS other than a Garmin. How do I read the routes? Our route discs come with both .gdb (Garmin) and .gpx (Universal GPS format) files. Load the GPX file into your software, then upload the routes from there. Frustration #10 - I got a file with a lot of routes in it. How do I load just the routes I want for today? Create a new file called something like TodaysRide. With it open, open a new window with the original file you want the routes from. Copy and paste just the routes and tracks you want from there over to TodaysRide. The waypoints will follow automatically! Got more confusion about GPS? Email us your questions and perhaps we'll run a part two.